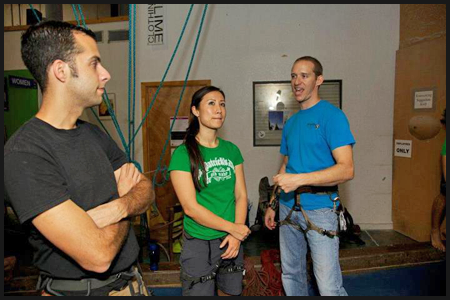 There are climbers that come in once and a while, and there are members that sign up for memberships and come a few times a week. But then there are a select group of dedicated climbers who immerse themselves into the sport and adventure. We are fortunate to have the perfect pair who fits this category within our Aiguille Family and that’s Sandra Chun and Howard Sherman. Sandy and Howie are naturally active people and climbing certainly became second nature extremely quickly once introduced to them over a year ago. Both born in New York and both graduating with MAs from Binghamton University, they have relocated to Orlando and become one of the Aiguille Family. Howie says that Sandy is like a “gambler”, but instead of money on her mind she is always thinking about routes. When I asked her how she viewed her climbing style, “slowwwww” was the first word to come to mind, or also known as being, in her words, “precise or deliberate”. Already athletic thanks to her family background and active nature, Sandy also possesses good balance, high flexibility, and a very “strategic” and technical approach to her climbing. 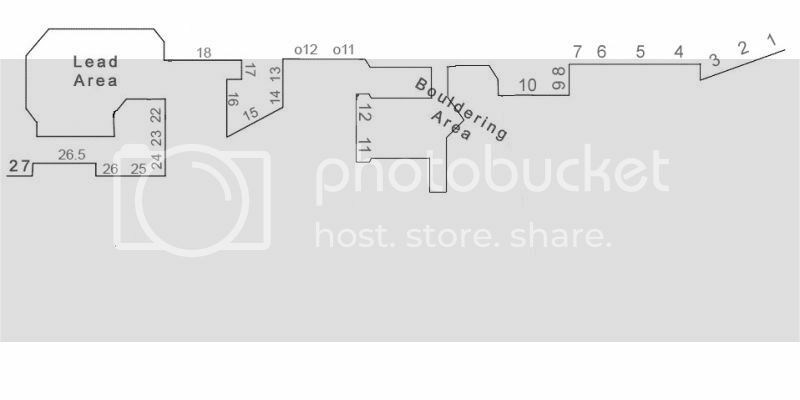 Her favorite routes involve crimpy and textured holds, interesting starts, fluid movement, and maybe just a few bold, exciting moves. This slow and precise manner also shines in Sandy’s focus on her gear. “I tend to research all gear to see which brand names are the best of each product that I need (or want). 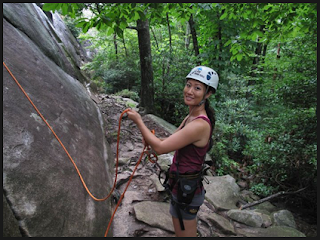 I highly recommend always climbing with a helmet.” Sandy feels that while not only protecting you from falling objects while climbing or belaying, but she frequently tends to hit her head on the wall or a tree as she looks for her next hold. Hey, it happens to us all. 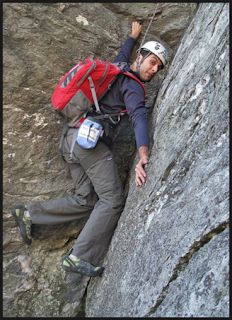 Howie’s climbing style is quite the opposite of Sandy’s. “I would describe my climbing as thoughtless... 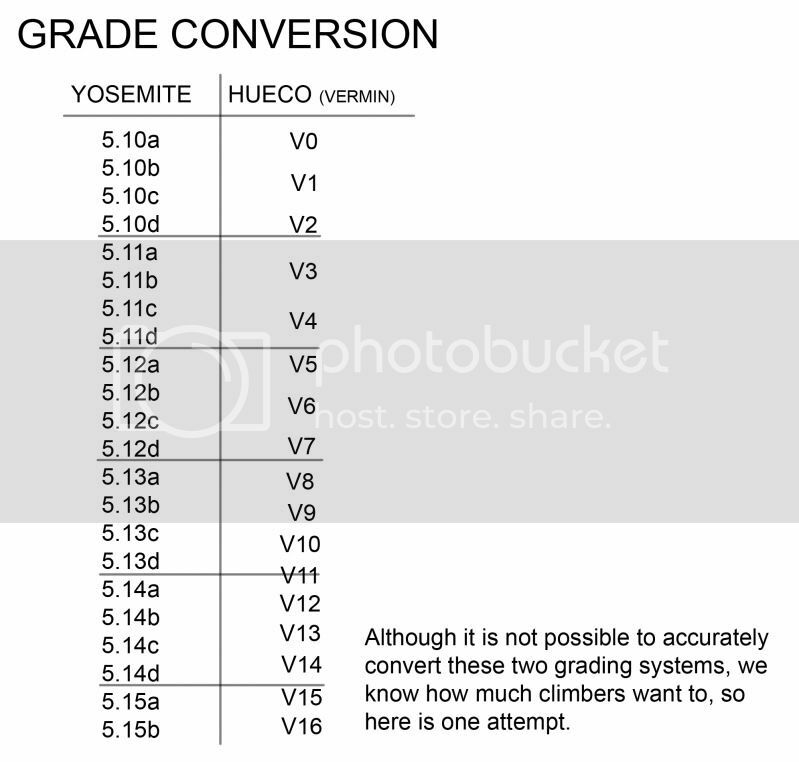 I just climb and react.” Howie has an affinity to slab routes, but really any route that forces him to use technique and read the beta. I love actually watching Howie climb because he is also very persistent, working the moves until he gets it right, even though I think he should take the whip. 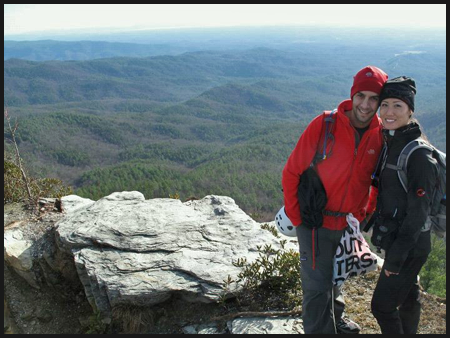 In the off time, hiking and being outside in general has made climbing a really natural addition to his hobbies. Howie hopes to soon move somewhere that actually has mountains and continue to explore and develop his climbing prowess. Neither Sandy and Howie focus a great deal on training, however Howie does instruct the readers to “make feel bad about not training”. The couple trains mostly by just climbing everything. Their introduction to lead climbing alone opened up a whole new approach to climbing and opened up many new routes for them to climb or in their case, train as well. And where is a better place to “train” than Aiguille? For Sandy, “Aiguille feels like my second home. 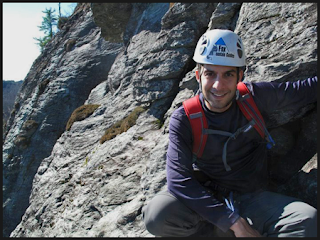 It’s fun to walk in after a long day of work... and see familiar faces, try some great routes, and just hang out.” For Howie, climbing at Aiguille is very enjoyable and they “have met a ton of really awesome people while climbing”. But most importantly, they enjoy and find themselves lucky to have the routes and creative routesetters working away (aww thanks guys!). In their solid year of climbing and through Dean’s and Karsten’s instruction, as well as other guides, Sandy and Howie have probably seen and accomplished more than half our members who have been climbing for years. 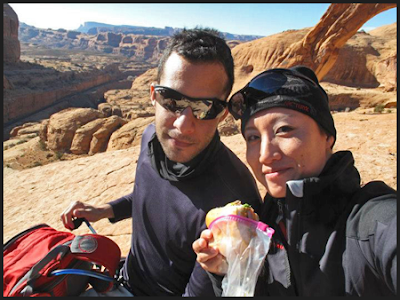 This past Christmas, although there for the primary purpose of a family vacation, Sandy and Howie snuck in a day of crack climbing in Moab, Utah in 40 degree weather, fighting the fear of their first 5.10 crack...as their first crack climb ever, as well as the feeling of 18-wheelers flying past the belayer on these roadside routes. Although treacherous sounding, it was an amazing experience. 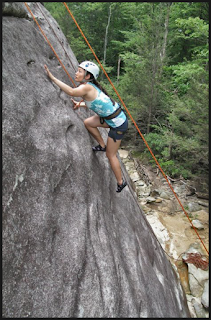 They have also recently spent time at the Red River Gorge in Kentucky where they attempted to get to The Chocolate Factory at Pendergrass-Murray Recreational Preserve but ended up getting lost for hours on their hike. After maneuvering through some boulders to find something they recognized, they found something they recognized indeed . “It was all worthwhile when we squeezed between some large boulders, turned the cool, dark cornder of a dramatic dihedral, and found ourselves staring up at the artfully streaked sharp-edged, massively overhung splendor that is Pure Imagination. It was awe-inspiring and much more impressive in person. 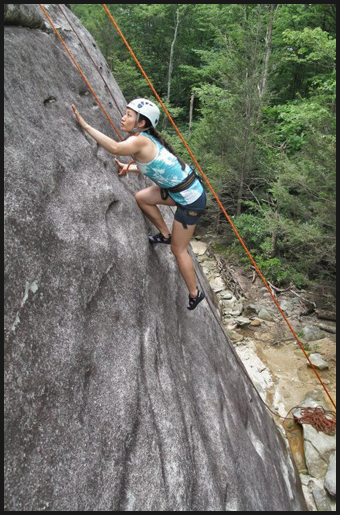 And we were able to play around on it to climb to the first few bolts.” Pure Imagination, graded at 9a and made even more well known through the ascent by Sasha DiGiulian, is considered one of the hardest climbs in the entire Red River Gorge and they climbed on it. How many of you can say you’ve done that?